Try on the Huipil (pronounced “wee-pil”), a boxy blouse usually decorated with embroidery, traditionally worn by indigenous women of Mexico and Guatemala – think Frida Kahlo! These loose, cotton pieces make cool and colourful statement pieces in your casual, summer wardrobe. Huipils are simply constructed from three rectangular pieces of cloth. The fabric is dependent on the indigenous group and its location. Heavier fabrics such as wool and velvet are used in cooler, mountain regions, while cotton muslin is the material of choice in areas effected by equatorial heat. The term huipil refers to anything from a short tunic to a longer dress-length piece. The embroidered decoration is symbolic, conveying family and village identity, along with the marital status of the wearer. The complexity of the embroidery is matched to the occasion, with simpler huipils for daywear and more elaborate huipils for special occasions such as weddings. The huipil is designed to be worn tucked into a corte, a tubular piece of fabric worn as a skirt and secured with a belt. A huipil from start to finish takes months to complete. 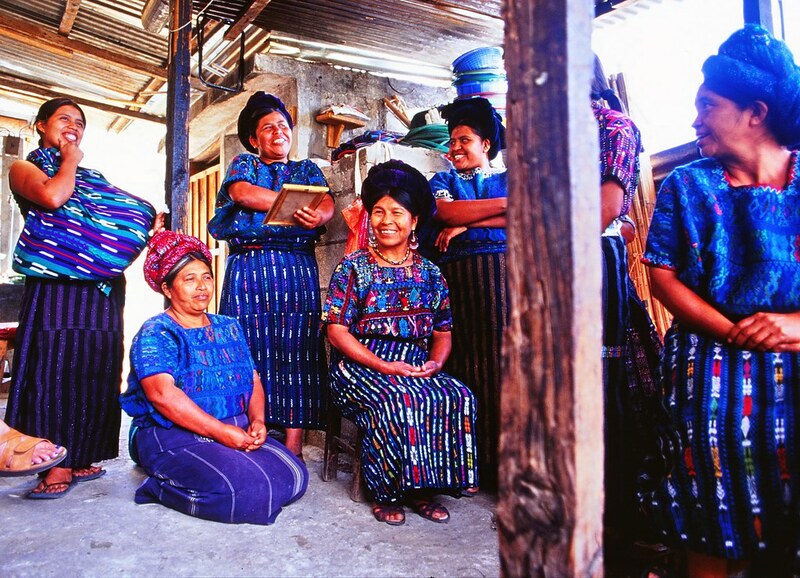 The garment begins as 2-3 rectangular pieces of cloth, traditionally woven on a back-strap loom. These are sewn together and a hole cut for the wearers head. The sides may be left open or closed with armholes, creating a poncho style, sleeveless top. There are many shortcuts being introduced to produce huipils en masse for tourists, at a cheaper price. Even the one I eventually gave up and bought on the tourist-frequented Yucatan Peninsula is a hand embroidered panel sewn into a machine-made cotton garment. I can’t wait to get up into the more remote villages of Guatemala or Mexico and find a more authentic and truly artisanal creation. When examining a huipil pay attention to the inside of the embroidery and seams, the difference between machine and hand stitches is obvious. If new, the woven fabric will likely be stiff and will soften with wash and wear. Wash your handmade huipil in cold water with mild soap and line dry. I put my pseudo handmade piece in a lingerie bag and washed it on a cold, delicate cycle in the machine and it came out as good as new. The elaborate embroidery of a huilpil is an effortlessly chic pairing with jeans or denim shorts and sandals. Dress it up with classic black in a skirt or pants and a pair of heels. If you have a heavier huipil appropriate for cooler weather, pair it with leather pants or skirt and tights. 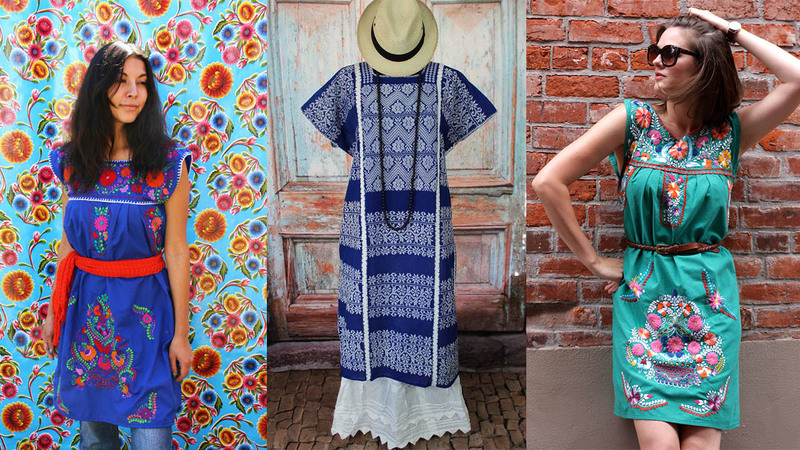 Cinch the waist of a dress-length huipil with a belt, or wear it loose with a cute hat. Accessorise with a chunky neclace that echoes a key colour in the the embroidery. Take inspiration from the 19th centuries coolest and arguably most famous huipil maven, Frida Kahlo, by styling your hair in some braids and wearing some dangly earrings. If you’re feeling extra bold, add some fresh blooms to your locks. Huipils and leather from left to right: Oaxaca huipil with faux leather by Callixto; and Alejandra from Mexicana Chic. I haven’t come across any particular etiquette or inappropriate time/place to wear a huipil. Of course, like any Soulful Souvenir, I encourage you to buy it as direct from the producer as you can. These are artisan pieces that take many hours to make, consider this when negotiating a fair price. 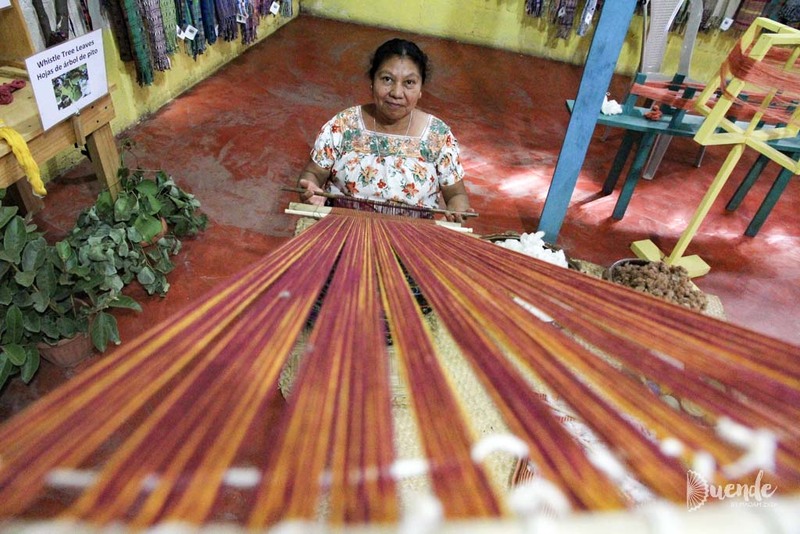 Often weavers will sell their huipils very cheaply in desperation to pay for life’s basics, particularly in Guatemala. Furthermore, try to learn a little about the symbology of the embellishment and how it relates to the culture of the particular indigenous group. It not only makes a great story when someone asks you about your gorgeous outfit, but makes the experience of donning your huipil that much richer. Rock your huipil and share your styling secrets with a us in the comments below. If you can’t make it to Central America any time soon but can’t wait to get your hands on a huipil, check out Coleccion Luna on Etsy, for a devine collection of vintage pieces from the Guatemalan highlands.